During the late Pleistocene age (about 1 million to 11,000 years ago) ancient carnivores would have been about twice as large as the wolves, lions, and hyenas we know today. Scientists call them hypercarnivores. But were these hypercarnivores able to take down enormous herbivores like the Columbian mammoth, mastodons, and giant ground sloths? To answer that question, scientists used mathematical models and here’s what they found: The largest cave hyena might have taken a 5-year-old juvenile mastodon weighing more than a ton. 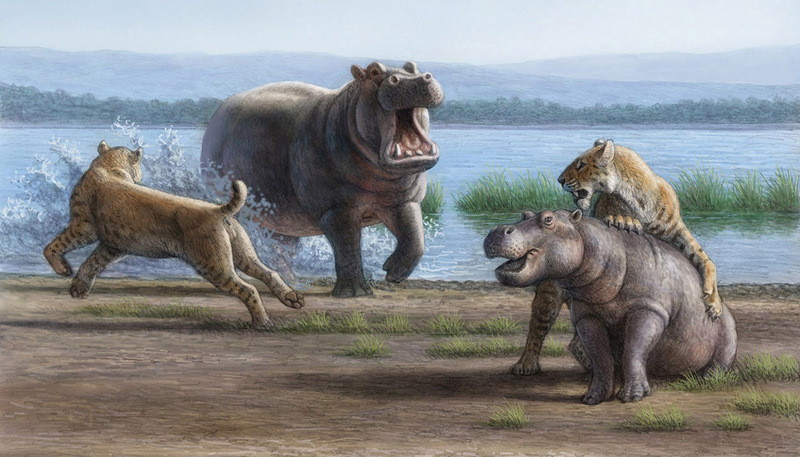 And, hunting in packs, hyenas could bring down a 9-year-old mastodon weighing two tons. It’s also true that humans have picked off most of the larger predators, changing our estimates pretty dramatically, says UCLA paleoecologist Blaire Van Valkenburgh, lead author of the study published in the Proceedings of the National Academy of Sciences. “So much of our science is based on the last 50 or 100 years,” she adds, but populations of big cats and wolves would have been much larger before humans arrived on the scene. How big was a baby mastodon? The work grows out of a 2014 symposium on the consequences of megafauna extinctions in the Pleistocene. Most of the discussion at the conference in Oxford was on herbivores, Van Valkenburgh says. “I’m a carnivore person,” so she wanted to make sure the superpredators had a seat at the table, too. “We’re all just trying to understand the Pleistocene and how rich that ecosystem was,” Van Valkenburgh says. Van Valkenburgh’s analysis estimated size ranges for Pleistocene predators based on the fossil record, including teeth. Well-established formulas allow researchers to make a reasonable estimate of an animal’s size based on just the first molar. “And in the fossil record, the one thing we’ve got a lot of is teeth,” she says. This led to the question of how large their prey could have been. “Blaire came to me with the question, ‘How big was a baby mastodon? '” Roth says. “It’s hard to weigh an elephant; you need a truck scale,” Roth says. And truck scales aren’t the easiest thing to lug around the African savannah, so field researchers monitor shoulder heights in tracing a growing elephant’s size. Nonetheless, they developed a range for what some of these shaggy grass-eaters would weigh. From this, an analysis by Matthew Hayward of Bangor University calculated whether these big predators might be able to capture an herbivore. Juvenile elephants do fall prey to lions in contemporary Africa, the study notes, but it usually involves a coordinated attack by a group of carnivores. “In Botswana, lions were observed to regularly use a strategy in which one to two lions leapt onto and bit the back of the victim while others on the ground worked to sever the relatively thin flexor muscles of the hind limb,” the study says. Hunting in packs—as modern lions, hyenas, and wolves still do—would have made even larger juveniles susceptible. Van Valkenburgh says that larger pack sizes, which may have been more common in the Pleistocene, further enhance hunting success. The National Science Foundation supported Van Valkenburgh’s work.